The capacity building workshop series for the 2014 Equator Prize award winners began early Thursday morning with facilitators Esther Mwaura and Mohamed Arguine welcoming the group. Participants were asked to introduce themselves to one another and offer a brief summary of the work of their organization. 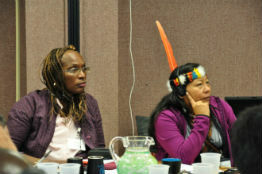 This year’s participants traveled from Asia, Africa, Latin America, the Caribbean and the Pacific Islands. They work in areas of smallholder agriculture and food security, sustainable forest management, water security, sustainable land management, ecosystem restoration, biodiversity conservation, marine and coastal resource management, indigenous- and community-conserved areas, and women’s leadership. Altogether, the 25 Equator Prize award winners represent some of the world’s leaders in grassroots development efforts that address the problem of climate change. 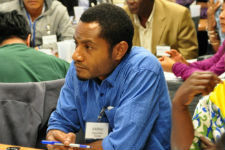 The second session of Community Dialogues, titled Messaging with Impact!, was designed to provide the participants with a general background of the Equator Initiative and UNDP, as well as to discuss how the winners might maximize their opportunities to share their messages on an international stage. Alejandra Pero, WIN Coordinator with Equator Initiative, began the workshop with an explanation of UNDP and its role as a broker between governments and community stakeholders with the goal of driving and sustaining growth and improving quality of life for everyone. UNDP, she explained, focuses on helping countries build and share solutions in four main areas: (1) poverty reduction and achievement of MDGs, (2) democratic governance, (3) crisis prevention and recovery, and (4) environment and energy for sustainable development. As part of the Environment and Energy Group of UNDP, the Equator Initiative was started in 2002 with the purpose of discovering and giving visibility to the great work that is taking place at the community level. The Equator Initiative believes that these “best practices” must inform policy on a larger, global level. Since its commencement 152 organizations have won the Equator Prize, which has resulted in an equal number of case studies that document the work and methods of each community. 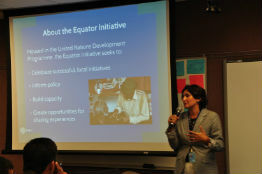 Ms. Pero also explained the purpose of Equator Initiative’s Community Dialogues, which is to highlight the importance of community work in biodiversity conservation and poverty reduction, to recognize and celebrate the winners’ achievements, and to provide a forum through which community representatives can interface directly with global and national policy makers. The final portion of the session focused on how to interact with influential individuals so that they might be supportive to an organization’s cause in future decisions and engagements. It is necessary for these leaders to understand the work that is being done on the community level, and what the potential impact could be if additional resources were available. It is especially important to be able to articulate the specific resources and support needed to maximize each group’s impact. Finally, each winner was invited to attend the World Conference on Indigenous Peoples on 22-23 September 2014. The community dialogues commenced with a presentation by Mr. Chris Patterson from Oxfam America. Mr. Patterson, who has worked in grant writing and donor relations for the past five years, took a moment to express how inspired he was by the innovative achievements of Equator Prize winners. The objective of his workshop was for participants to gain the skillset to secure funding opportunities and to build and sustain positive donor engagements in the future. 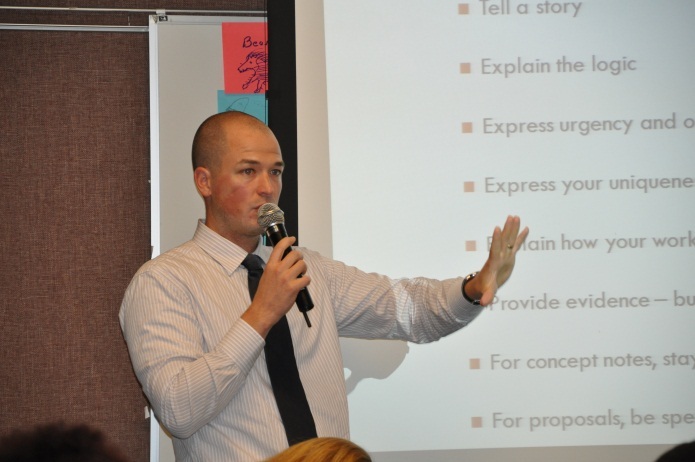 Mr. Patterson provided valuable and practical guidance to secure funding, explained the process of grants from a donor-perspective, and facilitated conversation on fundraising challenges and successes. Mr. Patterson divided his grant seeking advice into a series of helpful Do’s and Don’ts that thematically focused on identifying and researching donors, relationship building, communicating with donors, and writing proposals. The art of proposal writing captured the attention of community leaders as it is one of the most challenging parts of gaining funding and donor support. Mr. Patterson emphasized the importance of framing an organization’s narrative in a succinct but captivating way, providing evidence while emphasizing significance, conveying the uniqueness of the program and stating the organization’s urgency for donor involvement. Other helpful tips included being accountable for financial reports, reading the fine print in donor contracts and framing efforts as a scalable solution to the stated problem. Ms. Nina Kantcheva and Ms. Gayathri Sriskanthan, both with the UN-REDD Programme, co-led the fourth session that discussed their work with local and indigenous communities, especially those in forested communities throughout the world. The UN-REDD initiative was jointly established in 2008 by FAO, UNDP, and UNEP with the ultimate goal of reducing emissions from deforestation and forest degradation in developing countries. UN-REDD currently operates in 55 countries with 21 national programmes. 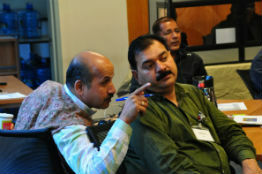 The co-presenters began by showing a brief video that explained the scope and location of the organization’s work. Following the video introduction, Ms. Kantcheva explained the three phases of UN-REDD programming: Phase 1 focuses on evaluating the readiness and capacities of a country to implement REDD programming; Phase 2 aims to evaluate the application and creation of supportive policies that enable capacity building; and Phase 3 looks to complete implementation where resource distribution and benefit sharing are met. Ms. Sriskanthan finished by discussing the importance of UN projects that coordinate with local and indigenous communities, as well as the challenges associated with ensuring the social inclusion of indigenous communities.